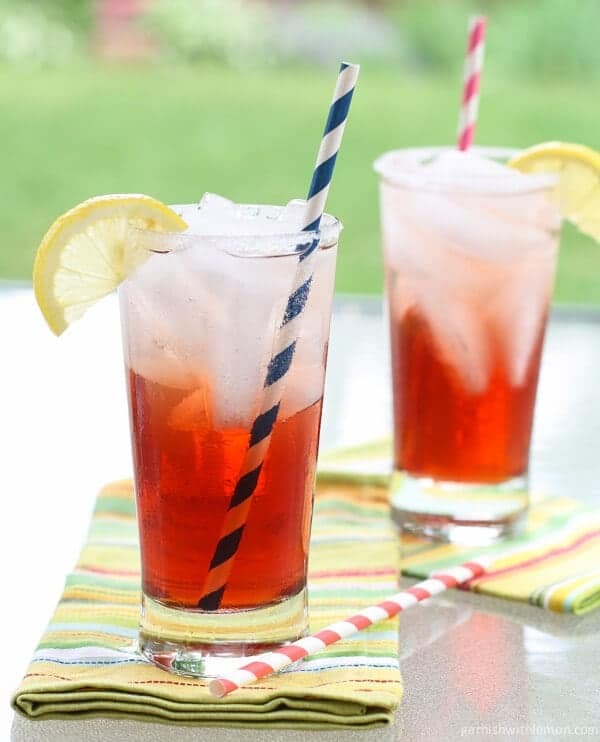 Cranberry Tea Spritzers are the perfect thirst quencher on a hot summer evening. Our July has been heavenly. The kids’ sports schedules wrapped up, and we have our evenings back as a family…holla! Kevin doesn’t like to eat dinner the second he walks in the door, so we enjoy a leisurely evening before we eat. After a quick change, Kevin likes to relax, catch up on the day, read the paper and play a quick game of catch in the backyard. And naturally we do it with drink in hand. These Cranberry Tea Spritzers are a perfect thirst quencher on a hot summer evening. I gave up drinking soda about 18 months ago and have upped my water intake considerably. But sometimes my tastebuds want something a little different, and this is where Pure Leaf Iced Tea has been a refreshing addition to my fridge. I acquired my love of iced tea from my parents, who are both enthusiastic iced tea drinkers, but brewing it myself is not something I want to do (and you just can’t fake the taste of real tea). But Pure Leaf takes care of all the work for me with their convenient real brewed tea that tastes just like my mom used to make it – except all I have to do is open the bottle for perfectly brewed tea with no preservatives and the hint of lemon that I love. In this Cranberry Tea Spritzer, I got a little crazy with my Pure Leaf Lemon Tea and added some cranberry juice and a splash of club soda. Garnish your glass with a sugared rim and lemon slice, and you are ready to drink in style. If you really want to shake things up, citrus rum is a delicious addition. Pour all your ingredients into a pitcher, and you have drinks for a crowd. The icing on the cake (or the sugar on the rim, in this case) is I get to support a worthy cause at the same time I enjoy my iced tea. Pure Leaf has partnered with Wholesome Wave for its “Share the Love of Leaves” campaign. Wholesome Wave is a nonprofit that focuses on making fresh, healthy, locally grown food affordable and accessible to everyone. With an initial donation of $100,000, Pure Leaf has agreed to donate an additional $1, up to $50,000, for every social engagement from fans on Pure Leaf’s Facebook or Tumblr pages, and use of the #loveofleaves hashtag on Instagram and Twitter. This total donation of $150,000 will provide 100,000 pounds of locally grown fresh fruits and vegetables for communities nationwide. The #LoveOfLeaves goal is definitely one I want to support, and I hope you’ll join me. Head on over to Pure Leaf’s Facebook and Tumblr pages to “Share the Love of Leaves” and trigger a donation to support the mission. For even more information on Pure Leaf, check out them out on Twitter, Instagram and Pinterest. 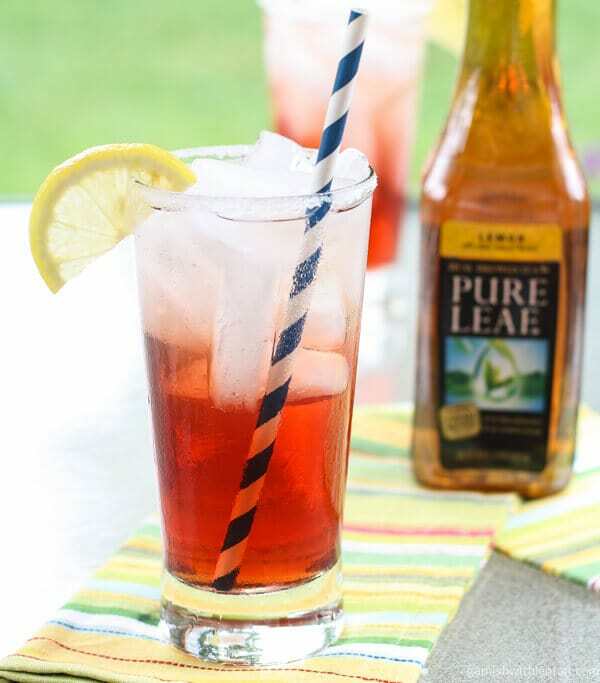 Disclosure: Pure Leaf Iced Tea sponsored this post, but all opinions are my own. Place Pure Leaf Lemon Iced Tea, cranberry juice and rum (if using) in a shaker filled with ice. Shake vigorously to combine. Wet the rim of a highball glass with a lemon wedge and then invert glass in a small bowl filled with sugar and rim the edge of the glass with sugar. Fill two glasses with ice cubes and divide contents from shaker equally between the two glasses. Fill to top with club soda and garnish with lemon before serving. I LOVE Pure Leaf Tea! That looks like the perfect refreshing drink! Pinned! That tea is amazing! These are a perfect summer drink! I’ve tried to stop all soda drinking as well, and I also replaced it with Pure Leaf tea! I buy the unsweetened because I like using stevia, this spritzer looks like something I NEED to try! It’s a tasty replacement for sure! I love cranberry and I love tea … so this is perfect in my eyes! Me too! It’s such a delicious combination! Yep, I am not a soda drinker at all. I don’t find it refreshing when I am thirsty. Water does the trick. And does tea. Quick and easy drink and utterly summery. This looks like a great drink to relax with after a long day of work! 🙂 Love it! If I am going to drink tea, it better have cranberry in it! Refreshing way to cool down in the heat! Completely agree, Jamie! So refreshing!